Email questions to peter_cadman@hotmail.com or copy and paste: peter_cadman@hotmail.com. 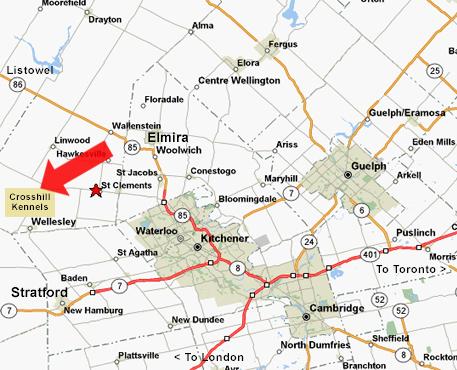 From Toronto take Highway 401 West to Hwy # 8, and exit 278 to Kitchener Waterloo (keep to the right). Hwy# 8, – take the two lane ramp to the right to, # 85 WATERLOO NORTH, continue along the expressway #85 past University ave, past King street, past Northfield drive, then exit right to the St.Jacobs ramp (which is The St.Jacobs Farmers Market District exit, or Regional Road #15) . At the exit ramp lights turn left, and go over the expressway and follow the “signs” to Heidelberg, St.Clements and Crosshill. The road sweeps right, go through the lights and turn left onto Lobsinger Line just before the ESSO gas station (referred to as Wagner’s Corners). If you go into St.Jacobs, you have gone too far. You are now on Lobsinger Line or Waterloo Regional Road #15. 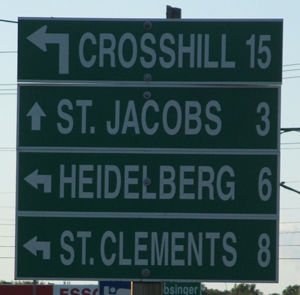 Take this through the first town, Heidelberg and the next town St.Clements continue approximately 6k until you come to a T-intersection at the Village of Crosshill. Turn right at the T, we are in the Village of Crosshill "THIS GERMAN SHEPHERD DOG KENNEL SIGN" is at the end of our laneway. One and a quarter hours from Toronto International airport Hwy#401 west. One hour from London Ont. Hwy# 401 east. Thirty minutes from Stratford Ont. Hwy# 7 to Wellesley. Two and a quarter hours from Buffalo N.Y, Hwy # 6 Guelph to Hwy# 401. Four hours from Detroit Mi. Hwy# 401 east . Five hours from Ottawa Ont.